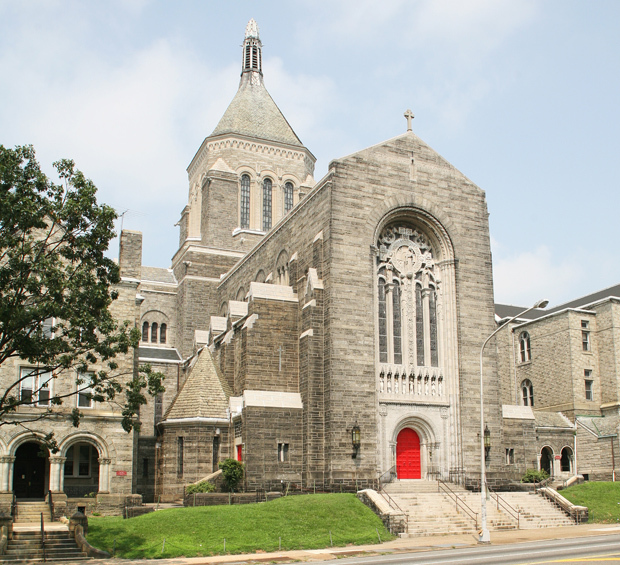 Our Lady of Hope Parish, located at 5200 North Broad Street in North Philadelphia at the site of the former Holy child Church, became the new spiritual home for Catholics of the area after a 1993 parish merger. Lent is a season of taking stock. Maybe through daily Mass or joining a Bible study group or reciting the rosary or participating in a religious retreat. All are good, quiet ways of bringing God back in your life. Now if you want a lively way to revive your spiritual life, you might consider a revival. For example, at Our Lady of Hope Church on North Broad Street in Philadelphia, there will be a revival this Friday and Saturday, Feb. 19-20. The title “What Are You Gonna Do? You Gotta Do Somethin!! !” gives the idea things will probably be more than a bit lively. The title was suggested by Father Anthony M. Bozeman, S.S.J., who is coming all the way from New Orleans to preach. Actually it is a homecoming, because Father Bozeman was born and raised in Philly — originally from Our Mother of Sorrows Parish where the late Father James Daly set the bar very high for him on just what a priest should be. After graduating from West Catholic and service in the U.S. Air Force Father Bozeman entered St. Charles Borromeo Seminary, while still keeping his hand in the Air National Guard. After his 2000 ordination he served as a parochial vicar at Our Lady of Grace, Penndel, and Our Lady of Hope. In 2006 he received permission to transfer to the Josephite Society of the Sacred Heart, a congregation that very specifically focuses on the African American apostolate. Missioned to New Orleans, he is presently pastor of 1,800-family St. Raymond and St. Leo the Great Parish. He is also chaplain for Xavier University Preparatory High School, which was founded by Philadelphia’s own St. Katharine Drexel. That is certainly true. Our Lady of Hope, where Father Efren Esmilla is pastor, is a tri-lingual parish with Masses in English, Spanish and Tagalog, representing the Hispanic, Filipino, African-American and European-American communities. The revival itself is expected to attract heavily from the African American community residing in Our Lady of Hope and also from many surrounding parishes. Brown herself, although raised in Our Lady of Hope back in the day when the grand old church was Holy Child, now lives in Malvern, Chester County. For her it isn’t coming back to her childhood parish, because in her heart she never left. In addition to Father Bozeman, participants will include Father Esmilla, Father Stephen Thorne and Father Gerard Marable of the Camden Diocese, as well as Deacons William Bradley, Felipe Hernandez, James Mahoney and Homer Panganiban, and lay readers Imani Scott and Gregory Damas. Music throughout will be led by the Philadelphia Catholic Mass Choir, under the direction of Kenyatta Arrington with dance selections by the Immanuel Dancers and the Cristo Rey Dancers. It’s fair to say if you attend you won’t fall asleep. The Our Lady of Hope “What Are You Gonna Do” revival will be conducted Friday, Feb. 19 from 6-8 p.m.; Saturday, Feb. 20, 2-7 p.m. and Sunday, Feb. 21, 8:30 a.m. with Mass followed by a continental breakfast.